A routine call for a Los Angeles County sheriff’s deputy at the Chantry Flat recreation area in the Angeles National Forest turned into a terrifying situation when his team noticed a large bear. 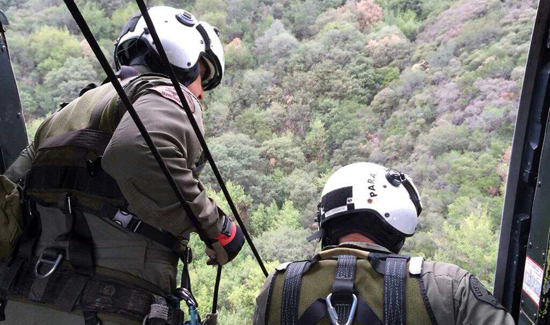 According to KABC-TV Los Angeles, Deputy Ricky Hernandez was being lowered from a helicopter to inspect an abandoned car in the brush on Sunday. When his team spotted the bear, they tried to warn Hernandez, but lost radio contact. The bear was startled by the chopper and ran off, but Hernandez knew it’d be back after finding a nest of bear cubs inside the car. “The vehicle was all torn up. All the liner and upholstery was cut up and made into a nest. I entered the vehicle… when I got inside I noticed two or three bear cubs inside there,” Hernandez said. Click here to see how it all went down.